Al Sharquiah is easily one of my favorite of the Al Rehab oils. It starts off with a not too sweet floral amber scent and dries to to what, to my nose, is a rich incense base. Rich, deep fragrance adds an aura of exotic mystery to your day. Alsharquiah is good for men and women. This is one of our best sellers. 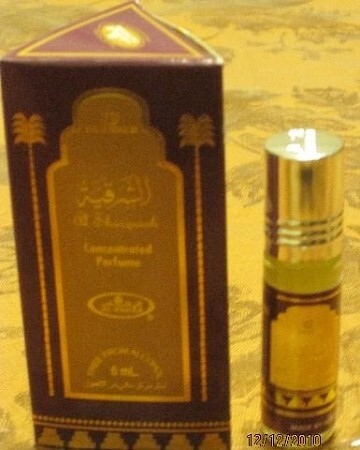 This is a greatest Attar I have ever smelled. First it was gifted by one of my friend, after using it first time, I really became crazy to get it more for personal use. Alhamdulillah I found Al Rasshad Books in CA and got it. Thanks to Al Rashad for an excellent and prompt service. Indeed it was a pleasant shopping experience. 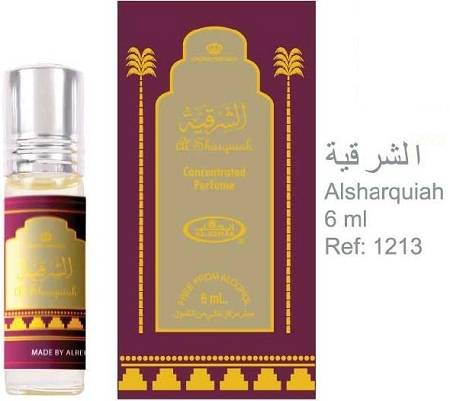 Al Shirquia is a spiritual oil attar, I will highly recommend its sue while praying to Allah and reciting Waziaf Duroods. This and Aseel are my favorites so far of the al-Rehab line. Long lasting rose and oud fragrance with a prominent note of sticky dates that softens down after awhile. Addictive. Very unusual to western noses, so probably not a good work fragrance. And, like all their oils, you must apply lightly. I like to put it on as soon as I get home after a long work week! Yum.